Last Sunday was a beautiful day for a run. 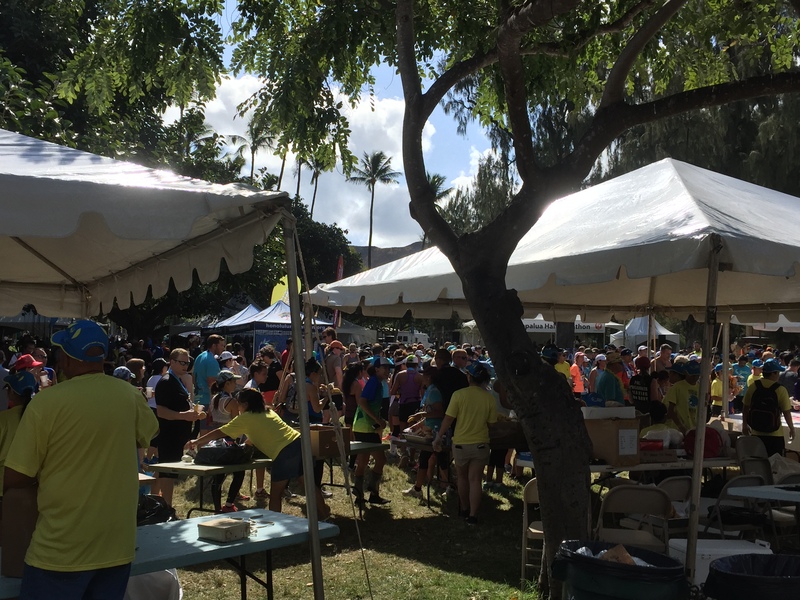 We gathered near the statue of Duke Kahanamoku in the early hours of the morning; the tiki torches were lit, the ABC stores were just starting to open, and the sun was peeking over the horizon as the Hapalua Half Marathon began. I rode to the race with a friend and we arrived early enough that we were pretty close to the starting line when the race began. It was cool to see Team Hawaii start; their running looked absolutely effortless as they sped away from us. I like to think that I look like that too, but unfortunately I’ve seen photos and it isn’t true. When the race started for the rest of us, I got caught up in the excitement and ran a little above my pace for a few miles. I was with the other Liz from the running group for the first 5k, and she informed me after the race that we ran our first mile in 8:50. Far too fast for me. I managed to keep a pretty good pace up for the first 10k, and then I started to get tired. And hot. And cranky. Runners getting their snacks after finishing. BY the time I saw Don and my friend Rosie, who was there to cheer her husband on, at mile 8, I had slowed considerably. There weren’t many spectators along the course like there had been for the marathon, and I was glad to see them and the cold bottles of Gatorade they had brought to share. While I was running, I felt terrible. 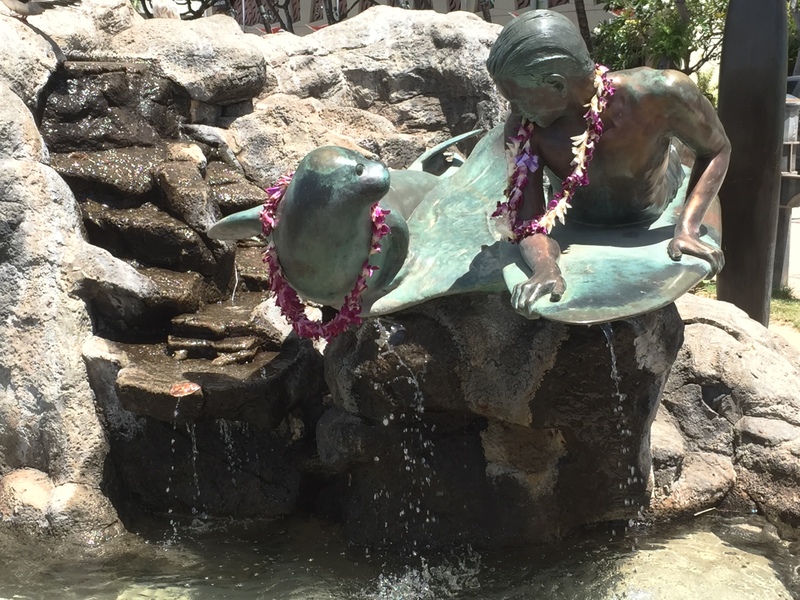 I was hot and tired, every time I took a drink of water, I seemed to forget how to swallow and did that awful thing where you aspirate the water and then spend the next three minutes coughing like you have emphysema, and I felt like I was moving in slow motion. Every step was painful, and I thought my lungs were going to spontaneously combust as I slogged up the long hill on Monserrat Ave. The one downfall of my FitBit is that it doesn’t give a good idea of your pace while you are running. I often gauge how hard I am working by my heart rate, but I try not to look at my watch a lot while I am running. I like to use it more for data analysis after a run; I worry that I will become obsessed with it while running if I rely on it too much. Instead, I usually listen to my body to tell me when I am going too fast, but I ignored it last weekend because I thought I was being wimpy. I wasn’t- I was actually going pretty fast. Guys, as predicted by my friend Mel on Facebook, my final time was 2:05:10. Lemme say it again: 2:05:10. Yes, that is a full ten minutes faster than my goal time of 2:15, and I said I would have been happy with any time under 2:30 (and I meant it!). I was ecstatic when I saw the race clock as I neared the finish line. 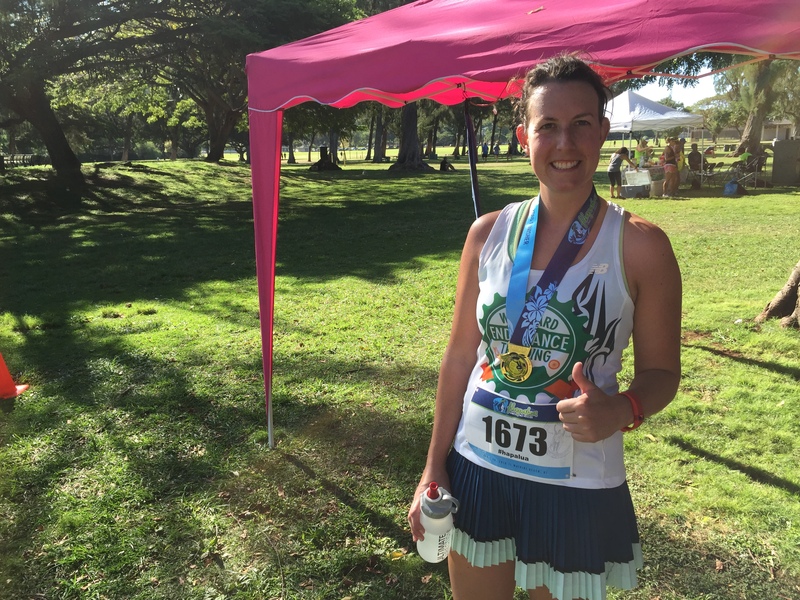 It’s not a time any serious runner would brag about, but for me, well, I might as well hang up my sneakers and call it a day, because that is about as good as it gets. At one point during the race, when I felt like death and was worried I was going to vomit or poop my pants (I did neither, by the way), I had resigned myself to accepting a slower time and being happy that I improved on my 10k time (it went from 73 minutes in my personal 10k race about a year ago to 56 minutes. This is a pretty good accomplishment in itself and shows what a year of dedication and training with people who like to run and know how to prepare for an event like this can do; I shaved almost 20 minutes off my 10k time! 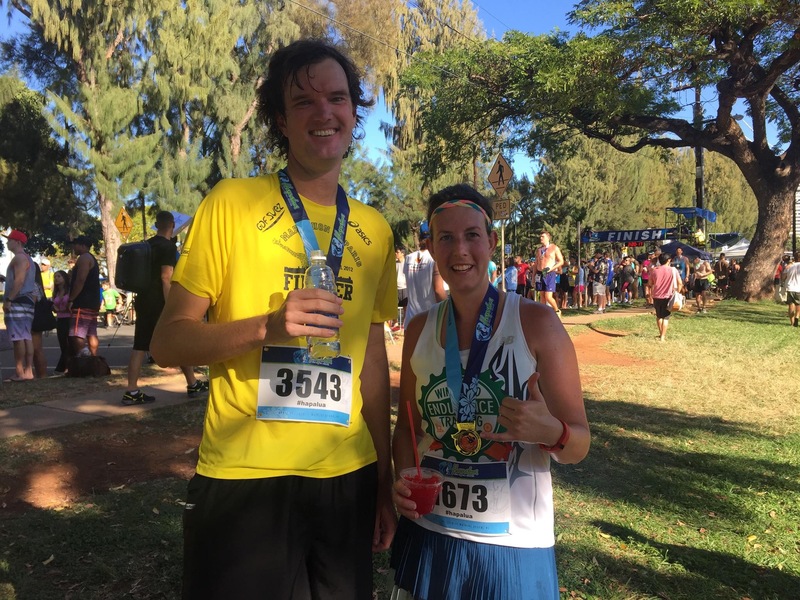 What I didn’t know at the time I was resigning myself to a slower half marathon than I’d hoped for was that I was actually working pretty hard. I guess the saying “no pain, no gain” rang extra true last Sunday. My new shoes held up well under the pressure of their longest run since their un-boxing. I did get a blister on the ball of one foot, but I think that was more a function of me not allowing the shoes enough time to break in than the fault of the shoe. I like the way they break over and I felt like I had more between me and the road than with my Topos. This runner gives the Newton Gravity V two enthusiastic thumbs up. The results tell me that I ran an average pace of 9:34 which is in line with what our group had been running in training. My overall pace for the full marathon in December was 11:34, but I’m not sure the two are equally comparable since in order to survive that longer distance, I’d have to slow down, but it’s nice to think that perhaps, if I keep training and trying to improve, I might run a slightly faster marathon this year. Time will tell. I looked up the results of the friend who I rode to the race with, and he ran an average pace of 9:13. I’m not surprised, he’s a million feet tall, but I am slightly aggravated because when he loped past me after we met up with our spouses at the 8th mile, he looked like he wasn’t even trying. I’m sure he was in as much pain as I was though. The one thing I’ve learned about running is that everybody suffers from ‘Fiery-lung Sweaty eyeball Dear-god-why-am-I-doing-this?’ syndrome. I should thank that part of my brain. It’s the part that made me lace up my sneaks for a lonely solo run this week, and it’s the part that keeps signing me up for these damn races. I think it is strongly linked to the ‘self-preservation center’ of my brain as it works very hard to ensure I do not become fused with the couch and that my diet does not consist entirely of frosting and bagels. Prepping for the Hibiscus will be harder since I don’t have the group to rely on to make sure I do the work that gets me to the finish line, but it’s not all that long of a time to maintain my fitness. Now that I know how hard I had to work to run 13.1 miles and beat my goal, I am inspired to see if I can push even harder and make that time a little faster next time. I let myself rest a little this week and ran only a short, slow three miles once. Tomorrow it is time to get back to work! 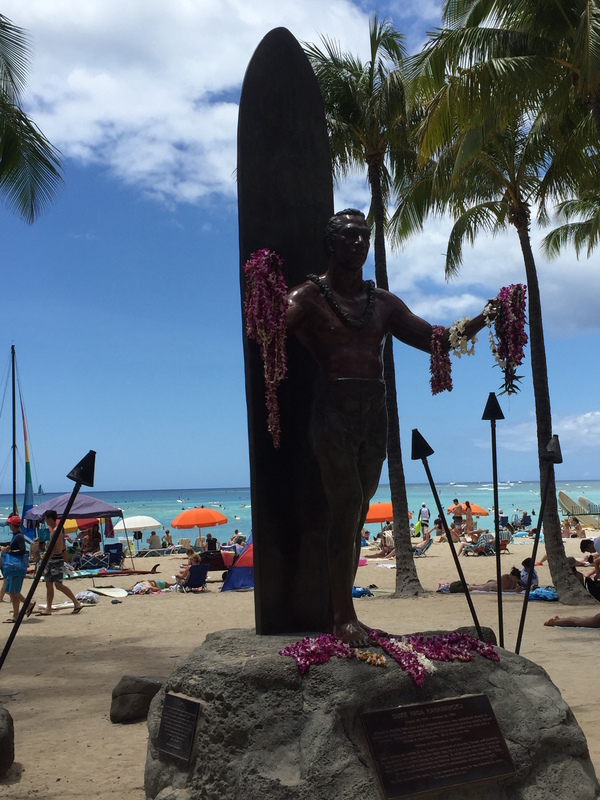 To the victors go the… shave ice! *JK. It totally matters. I’m an effing rockstar, you guys. Tomorrow is the big day- Hapalua Half-Marathon day, and while it kind of snuck up on me (as in when a co-worker and I were looking at our calendars to schedule something and she said “Well, next Monday is the 11th…” my response was “That means this Sunday is the 10th; I think I’m running a half-marathon on Sunday.”), I feel ready for it. I’m even fitter and faster than I was before I lined up for the start of the marathon, and the shorter distance makes me fee like I might be able to push myself a little harder to go a little faster. My ultimate goal is to finish the 13.1 miles in about 2:15, but I would be happy with anything under 2:30. My running cohorts tell me that this is totally possible, but they can’t hear the voice of dissension that creeps into my head and gets louder with every bead of sweat that I wipe from my brow. I think I’ve worked hard enough to be able to trust in my training and ignore all of the “I can’ts” and the “I won’ts” and the “I’m dyings” that pop into my brain to try to steer me off course. While we didn’t cover as much distance training for the half as we did for the full marathon (and why would we need to, the race is only half as long- for many of us it will be over by 8:30! ), we did train on an awful lot of hills- big hills, little hills, medium hills, long slow hills, short steep hills, long steep hills, hills that seemed friendly the first time we ran up them and then we ran up them again and again, hills where people were cooking breakfast or dinner and the smell of food wafted over us, hills where fathers were helping their sons train for football season, hills where bicyclists dismounted to walk up, downhills we sang the praises of in one direction that became uphills we cursed on the way home; there was no shortage of hills for the Windward Endurance training group. This is a really good thing because, while there is only one real hill on the race course, it is a pretty big one and it happens around mile 10. 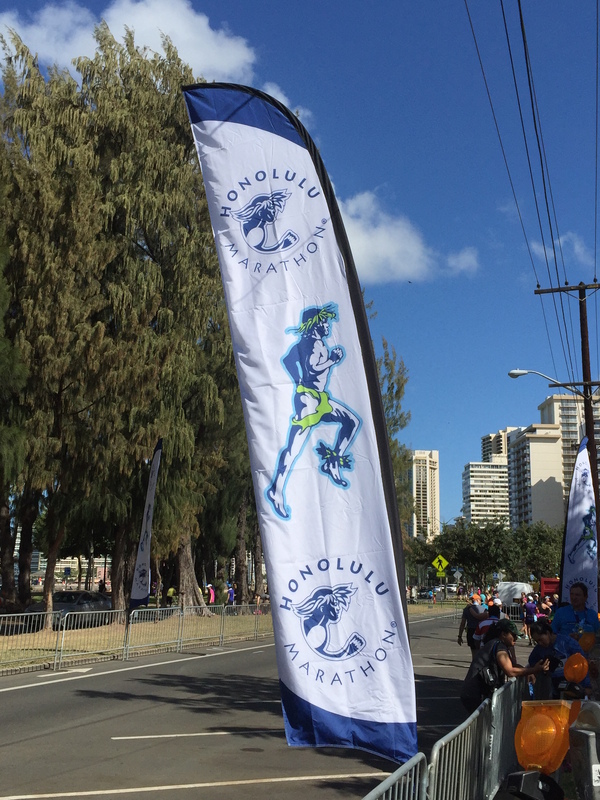 The Hapalua has a fun challenge called Team Hawaii vs. the World where the best local runners compete against a few professional runners from other countries. The local runners get a head start and the professional runners chase them to the finish line. 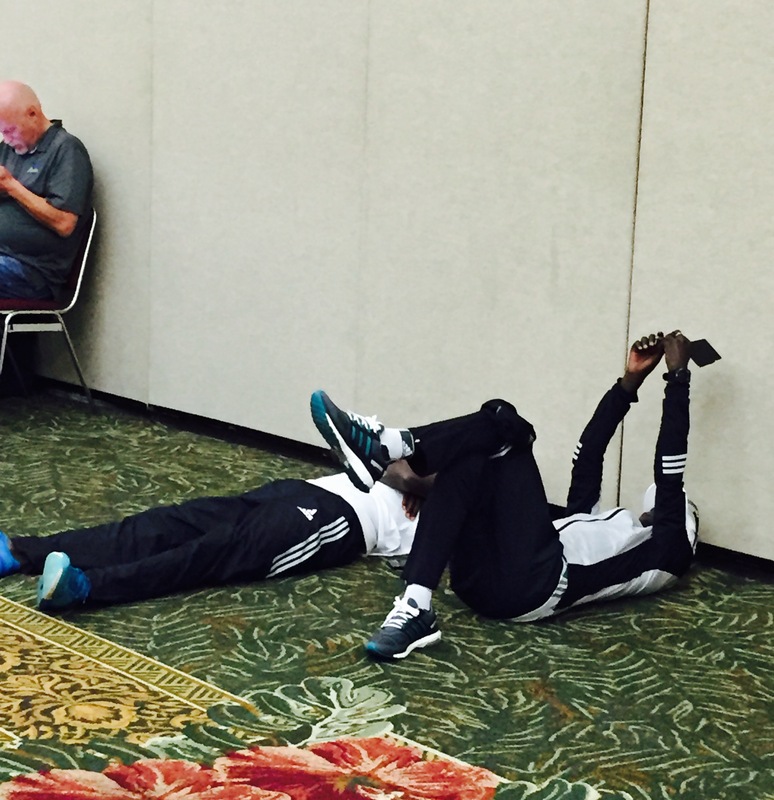 When I went to pick up my race packet yesterday, I spotted two of the professional runners taking a breather. Takin’ a load off before the big day. Don is sitting this race out because he has been too busy to train, but he and a friend who’s husband is running will be at mile 8 and at the finish line cheering us on. I’m enjoying my pre-race diet of carbs and ice cream (if eating ice cream before a race isn’t a thing, I vow to make it one) and am looking forward to this time tomorrow when I will have finished my run. Wish me luck, I’m going to take a cue from the pros and spend some time stretched out on the floor!